Hormel Foods Corporation (NYSE: HRL) today celebrates the grand opening of Progressive Processing LLC, its new production facility in Dubuque, Iowa. Progressive Processing, a wholly owned subsidiary of Hormel Foods, is the first new production facility the company has built in more than 25 years. Progressive Processing was built according to the Leadership in Energy and Environmental Design (LEED) Green Building Rating System, developed by the U.S. Green Building Council for environmentally sustainable construction. Hormel Foods has applied for LEED certification and expects confirmation in the coming months. Progressive Processing is expected to be one of the first manufacturing plants — and the only refrigerated food processing facility — to be LEED certified at any level. The facility will use at least 25 percent less energy and water than a plant built to meet current building codes and industry standards and was constructed using materials with more than 36 percent recycled content. Hormel Foods believes they will recoup the extra cost necessary to construct the environmentally friendly facility during the first two years of operation. The new facility, located at 1205 Chavenelle Court in Dubuque, spans 348,000 square feet. It will cost $89 million when complete. The plant officially opened on Jan. 25, 2010, when it produced its first run of Hormel® Compleats® microwave meals. 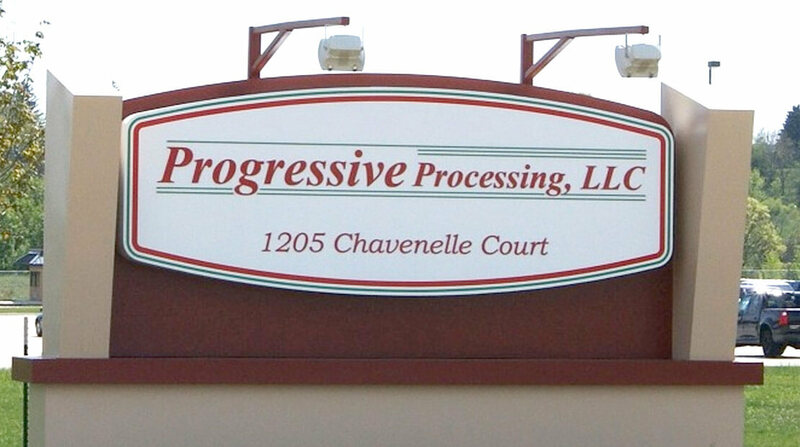 Progressive Processing currently employs about 90 team members. At maximum capacity, the company could employ up to 300 people. Additional employees will be hired based on business needs and as additional production lines are added. Currently, the plant is running one line of Hormel® Compleats® microwave meals. As one of four plants that produce Hormel® Compleats® microwave meals, Progressive Processing currently produces four of the most popular varieties: Spaghetti, Chicken & Dumplings, Chicken & Noodles and Lasagna. However, the facility has the potential to produce all varieties of Hormel® Compleats® meals and CHI-CHI’S® Fiesta Plates™ microwave meals. Progressive Processing is led by Mark Zelle, plant manager, who began his career at Hormel Foods 30 years ago at the Beloit (Wis.) Plant, first in the lab and then in quality control. He then transferred to the Stockton (Calif.) Plant in 1982 and worked there as the quality control manager until 1991, when he returned to the Beloit Plant to serve as the quality control manager and later as superintendent of operations. He then returned to the Stockton Plant as the plant manager, and served there for two years before moving to Dubuque to lead Progressive Processing. Zelle is a graduate of the University of Wisconsin at Whitewater. He and his family reside in the Dubuque area. Progressive Processing will donate more than 14,000 Hormel® Compleats® microwave meals from its production to the Dubuque Food Bank during the next year. For information on available positions at Progressive Processing, please visit www.accessdubuque.com. Hormel Foods Corporation Second Quarter Earnings Conference Call – Wednesday, May 19, 2010 Hormel Foods invites you to participate in a conference call to discuss the company’s second quarter results. Hormel Foods Corporation Announces Time Change For First Quarter Earnings Conference Call Hormel Foods has changed the time of the company’s conference call to discuss first quarter financial results to 8 a.m. CT.